UPDATED @ 3:30 p.m. with new information. Hey everyone. Well, we have a problem. The media wasn't allowed to watch this scrimmage. I have no problem with that. We do have a problem in that no statistics are being released from the scrimmage. What can I pass along? Hmmmm. TB Brad Lester said the offense was able to exploit the defense more often than he expected: ``We've never scored a lot of points on the defense, especially in the first scrimmage. It seemed like we almost did what we wanted to do on offense. Pretty much the defense couldn't stop us." Lester said of freshman WR Phillip Pierre-Louis: ``I've never seen anybody run that fast in my life. He looked real good." S Marcus Jemison's injury suffered Friday now is being classified as a leg injury. It previous was identified as an ankle injury. Tuberville said Jemison will be evaluated in Birmingham today. Tuberville said the scrimmage was governed by the new clock rules, which wasn't completely smooth sailing. ``It's as new for the officials as it is for us. It went pretty smooth. It is different. It's going to be different for the fans. It's going to be different for everybody when it goes to 25, when it starts at 40. Even the officials, you could tell they were thinking today rather than reacting. We've got to work at it and we'll do the same thing next week." The next scrimmage is scheduled for either Friday night or Saturday morning. I'm now building a video of some Tuberville comments. Ice Cube (Craig): Look, look, she's bendin' over! Bernie Mac (Pastor Clever): Lord have mercy! God is my shepherd and he knows what I want! Hey everyone. This is going to be a lightning-round list because I have to get back. My wife's anniversary gift is being installed today. It's a Sirius receiver. Can't miss that. Eleven years on Saturday. Another safety is down. Marcus Jemison, a freshman, injured an ankle mid-way through the practice. He was whisked away to the Athletic Complex pretty quickly. I didn't see the play. Some scribes who did said Jemison was involved in a scuffle immediately preceding the injury. WR Montez Billings played really well today. He caught two tough deep balls during 1-on-1s and held on for a touchdown catch during 11-on-11s. He crashed into Terrell Zachery after catching the ball. Billings was injured (not seriously) yet still hung on. DT Sen'Derrick Marks unloaded a huge hit on WR Mario Fannin during 11-on-11s. Fannin caught a screen pass and Marks was waiting. The hit prompted a mass celebration from the defensive sideline. 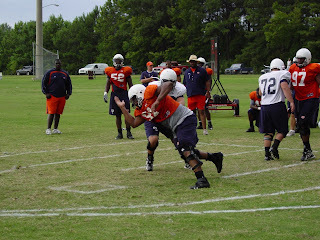 DT Zach Clayton performed well during the pass-rush drills. He's really violent with those arms. I think he can work well as a third-down rusher from one of the inside positions. He gets around people. CB Jerraud Powers grabbed an unusual interception during 1-on-1s. He initially locked down WR Quindarius Carr, who somehow broke away and cleared a few feet of space. The pass from Chris Todd was on target, but Carr didn't secure it properly. Powers snatched the ball off Carr's hip. Easy. Scrimmage tomorrow. The event is closed to both the media and general public. It's allegedly supposed to begin at 9:30 a.m. I'll post today's pass-rush results around 3:30 p.m. Here are your results from today's pass-rush drill. Keep in mind that defenders have the advantage here. I occasionally award an "E" for even ... which generally happens when a defensive lineman gets a good push, but is forced too far outside. 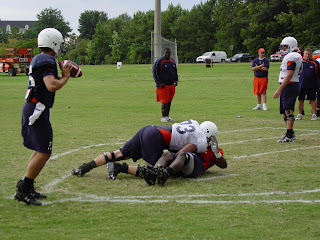 NOTE: Check out how many reps Derrick Lykes is getting inside. The coaches obviously are intrigued. Clayton (98) vs. Isom (57) -- 98 easy. 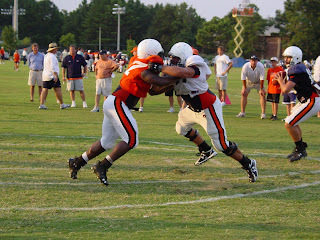 Mike Blanc and Byron Isom go at it during the pass-rush drill. Hot Carter and Lee Ziemba go at it during the pass-rush drill. Carter tried to burn by on the outside and Ziemba cut him off at the pass. Excellent work from Ziemba. Here's a shot from team drills. A couple of those DLs are getting up there to deflect that pass. That's Raven Gray on the outside and Sen'Derrick Marks inside. Hey everyone. 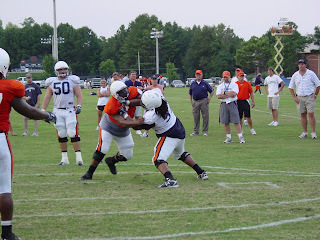 Here is a gander at what's happening this morning at Auburn practice. Sorry about some of the wind noise. I'm working on a solution. UPDATE: I misidentified TE Bryan Harris in the video. New videos uploaded. Hey everyone. The Olympics open today, though I watched USA-Japan soccer last night on Universal HD. Maybe it was a mirage. Auburnhttp://www.blogger.com/img/gl.link.gif practice allegedly begins at 9:30 a.m. I am planning to attend and provide my usual slew of insightful commentary, video and photos. Should have a video up by 10:30. Full report around 12:30. Hey everyone. Weird afternoon. The team started 45 minutes early because a thunderstorm was on the way. Around Period 13 (one period = 5 minutes usually), the rain arrived with force. I went from dry to drenched in 30 seconds. They were able to run some hurry-up team drills. Pass-rush drill was interrupted by rain. OT Lee Ziemba was back at practice today. He ran with the first team and participated in full-contact work. He seemed fine. I have a picture of him pancaking Antonio Coleman below. C Jason Bosley missed practice with that back injury he suffered on Wednesday. Coach Tommy Tuberville said Bosley could be back as early as Friday morning. DT Tez Doolittle was running around for the first time today. He's trying to come back from a ruptured Achilles tendon. He was hanging around for the pass-rush drill, but didn't participate. He feels good some days. Other days, he aches. Assistant coach Hugh Nall played around with his lineups during the pass-rush drill. Bart Eddins, who typically plays RG, was working at RT today. Ryan Pugh, who typically plays RT, was at C today because Bosley was out. Nall likes his guys to be versatile. TE Tommy Trott caught a nice ball for a touchdown during the 11-on-11 drill. The throw was from Chris Todd, who looked really good today. He's throwing with authority. 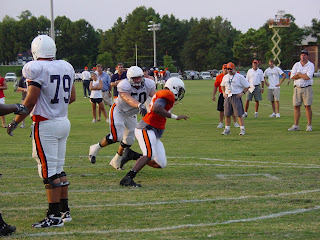 Auburn is trying to limit the quarterbacks to no more than 190 throws per day. Why 190? I don't know. Tuberville said that's a number Franklin likes. **Lykes getting a lot of reps lately. **Carter tried to cut inside and Isom was all over that. Andrew McCain tries to "fit" Antoine Carter to no avail. That happens to a lot of offensive linemen. Jake Ricks tries to bull rush Kyle Coulahan. The plan didn't work. Ricks uses a swim move here and cuts off Charles Bates. It was a wet one. When the HABOTN says you get a bonus, dadgum it, we mean business. UPDATE: I think there are YouTube problems afoot. Not sure what's going on. If you're having trouble accessing the videos, you're not alone. Some people were accessing them earlier. Now I can't even see them. I'll be working on this. UPDATE No. 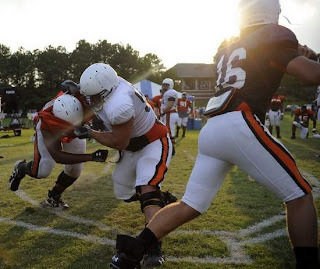 2: Auburn started practice 45 minutes early and reporters weren't notified. That's fine, of course, but it means there will be no practice video today. So it goes. I'll try to snag a player interview or two afterward instead. Hey everyone. As a reminder, today is the first two-a-day practice. Your faithful blogger is not in Auburn for the early session due to administrative circumstances beyond my control. I've been asked to cover coach Tommy Tuberville's appearance in Montgomery this morning. That means no morning practice report. It's out of my hands. I'll be attending the afternoon session and providing my usual daily update then. Morning work started at 7:15 a.m.
Tuberville is in Montgomery at 10 a.m. The afternoon work starts at 4:15. I'll keep you updated as the day progresses. I'm still planning to build the bonus video promised yesterday. It probably won't be a morning thing. I'm thinking early afternoon. CB Aairon Savage, as reported earlier, is out for the season. Coach Tommy Tuberville said doctors surgically repaired Savage's right knee this afternoon. Walt McFadden was running with the first-team defense today. Practice began late because of rain and was cut short because of lightning. They worked from around 5 p.m. until 6:35. It was the first day of full-pads contact. 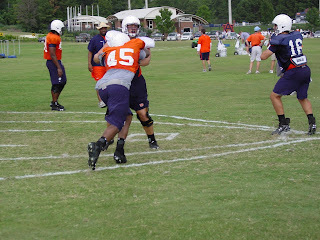 C Jason Bosley was injured during the pass-rush drill. He grabbed at his lower back and was off to the Athletic Complex within a few minutes. 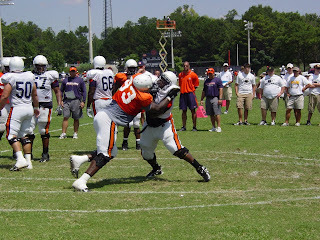 ``If you're a big lineman out here in this heat, you're going to twist something," Tuberville said. Freshman CB Harry Adams made a nice interception during 1-on-1 drills. The throw was a fade route from QB Chris Todd to WR Phillip Pierre-Louis. WR Terrell Zachery made his way just beyond S Zac Etheridge and caught a great pass from freshman QB Barrett Trotter for a touchdown. Really nice play all the way around. Neiko Thorpe looks like a player to me. He gets beat sometimes, but he's almost always near his man. Another guy who impressed me is DT Derrick Lykes. He fires off with a lot of aggression, which is exactly how Sen'Derrick Marks opened his career at Auburn. I'll report results from the pass-rush drills in a bit. 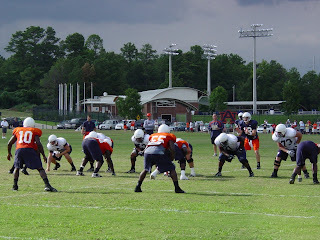 Auburn is holding a two-a-day tomorrow. Early practice starts at 7:15 a.m. and is expected to be the more aggressive of the two. The late show begins at 4:15 p.m.
**Bosley leaves the drill while clutching his lower back. **Nobody can even engage him. He swings his arm and he's gone. 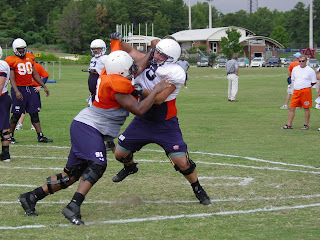 This is Ryan Pugh getting beaten by Antoine Carter. 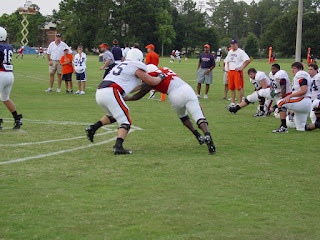 This is Raven Gray getting pushed way too far outside by Andrew McCain. This is Derrick Lykes going at it with Kyle Coulahan. This is Jake Ricks and Byron Isom dueling. Note that Isom is in almost ideal position. He "won" this one. Video very short today because of a battery problem. Interpretation: User error. I have enough footage for a second 8/6 video, but it'll have to wait until tomorrow morning. Consider that a morning present tomorrow. Auburn had a special guest throwing warm-up routes on Wednesday ... and you'll just have to wait before learning that person's identity. Both videos should be available. The Albany Herald is reporting that Aairon Savage is out for the season with a dislocated kneecap and tears to both the medial collateral (MCL) and anterior cruciate (ACL) ligaments. Savage is from Albany, Ga., and the story attributes the news to Savage's brother Antwone. I consider that a highly credible source. UPDATE: My dad was a radiologist until retirement earlier this year. He has seen thousands of MRIs. Though he obviously is not treating Savage, Dr. Tate believes Savage likely will be fine by this time next season. The MCL tear isn't a big deal. That particular ligament rebuilds nicely, mainly because it has a nice blood flow. The ACL is trickier. It doesn't have good blood flow and Dr. Tate says approximately 10% of surgically repaired ligaments never return to their pre-injury state. That means Savage has a 90% shot. Not too shabby. Dr. Tate said Savage was very lucky to have avoided damage to the lateral collateral ligament (LCL), which likely would have ended Savage's college career. A similar three-ligament tear sufered by New England Patriots tailback Robert Edwards in 2002 changed his career track. He didn't return to professional ball until 2004 and never was the same kind of player. Hey everyone. Practice is expected to start around 4:45 p.m. 4:15 today, which is a nice change of pace. The first hour of the 3:45 runs had been really hot. Now that hour is gone. I'd highly recommend you visit practice today -- it'll be the first full-pads workout of the season. I had a few HOTTIES email me about DeRon Furr and what I thought about this whole deal. I haven't really formulated an opinion. I probably won't because it's unclear what exactly happened. The intramural fields are vast. I spent most of my time watching skill players and offensive line. The Furr Incident happened on the defensive field. I didn't get a good look at what happened. S Zac Etheridge made it clear that Furr was roughed up in an effort to correct what players felt was a cavalier attitude. On one hand, yeah, that not exactly textbook sportsmanship. On the other hand, it's football and they're kids and stuff like this happens. I saw scouts from three NFL teams at practice. They were busy scribbling notes and looking like Secret Service agents. It's difficult to tell which players they're assessing. The Lions, Buccaneers and Falcons were represented. Former Auburn golfer (and current professional) Jason Dufner attended practice Tuesday, chatting up Tuberville about ... what else? Raven Gray is struggling. 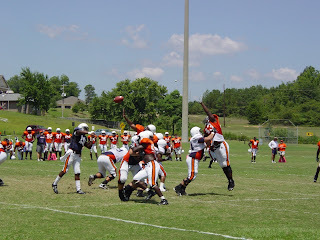 He was berated frequently during the first three days by position coach Terry Price. 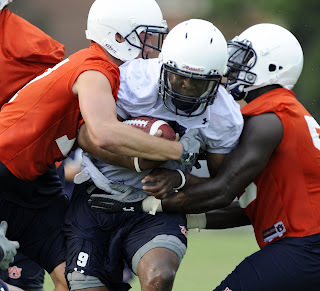 Gray just isn't quite up to speed with Auburn's practice protocol. He didn't take as much criticism Tuesday, but he didn't perform very well in the pass-rush drill. Not sure what to make of him right now. Definitely a work in progress. WR Charles Olatunji is out with a fractured collarbone suffered Monday. The play happened 5 feet in front of me. He went up, caught the ball over a defender and landed awkwardly on his left shoulder. The ball popped out. Olatunji then began moaning. It was painful to watch. S Aairon Savage will be examined by orthopedists in Birmingham on Wednesday to determine the next step. Coach Tommy Tuberville sounds like he's expecting surgery. S DeRon Furr is transferring. Furr and his father met with Tuberville earlier today and elected to take that step. Furr's last drill as an Auburn player ended with a beat-down from defensive teammates, which S Zac Etheridge said was a message to play more aggressively. The ploy apparently backfired. OT Lee Ziemba missed practice with a sprained knee. Assistant coach Hugh Nall said he was told it would affect Ziemba only for a few days. CB Walt McFadden, a junior, played in Savage's spot today. He played well in one-on-one drills and intercepted a Kodi Burns pass during the final 11-on-11 drill. He said afterward that he knows opportunity is here. "It's getting to be that time," he said. Tuberville said freshman DE Andre Wadley has been released from the hospital for a second time. Wadley spent nearly a week at East Alabama Medical Center in July after a voluntary workout. Tuberville said doctors still don't have a handle on what's wrong. Nall took time to praise OL Mike Berry and OG Byron Isom for their recent practice work. Today's practice ran from 4:30 p.m. to approximately 6:45. Partly cloudy. High was 94. **Bosley afterward: "Bull rush again? Learn another move." Video is fresh off the field. S DeRon Furr is not at practice. He is planning to transfer. Listening to Don Dunn yell around the 0:38 mark is fun. Hey everyone. Practice was pushed back again today, this time to 4:30 p.m. My goal is to shoot video, get that up around 5:15 p.m. and return around 7:30 for a practice report. *I'm reasonably sure S Aairon Savage suffered a dislocation of some kind Monday. I'm hearing there was no ligament damage, though some types of dislocations can be very troublesome. Either way, there has been no official comment from Tommy Tuberville just yet. *I'm expecting to report something more substantive about S DeRon Furr's status today. Things are happening. Hey everyone. Practice has been pushed back to 4:15 p.m. today. I'll be there to provide all the necessary information. As an added bonus, I may try to post my first-ever HABOTN video this evening. I have a sweet camera and some sweeter video-editing software, so maybe I can make miracles happen. Practice lasted 2 hours and 45 minutes. It was sunny, but a gentle wind kept things tolerable. CB Aairon Savage went down with a knee injury. He was on his way to diagnostics the last time I saw him. Savage was in pain. Coach Tommy Tuberville said he didn't have any additional information about the situation. Tuberville said S DeRon Furr's status "has not changed," but declined to elaborate on what that even means. S Zac Etheridge, who was involved in the fracas that ended Furr's last practice appearance Saturday, said players were trying to prove a point. Etheridge insinuated that Furr has been loafing and that teammates were trying to correct that behavior. Here's the quote from Etheridge: "It was just setting an example to the freshmen. It wasn't nothing but bumping heads. It's just showing them we're here to work and get to the championship." Freshman DE Jomarcus Savage humiliated OT Lee Ziemba during one rep of pass-rush drills. Savage took three steps toward Ziemba, faked inside, faked outside then rammed directly into Ziemba's chest. Ziemba fell on his back. Cockroached. Ziemba played much better before and after that play, but it was a pretty special performance by Savage. OT Ryan Pugh played particularly well in pass-rush drills. OG Tyronne Green and DT Sen'Derrick Marks played basically to a draw with each player winning his fair share. It's fun to see those two go at it. OC Tony Franklin said afterward that he's been very impressed with WR Chris Slaughter so far. Auburn added a pair of commitments today. The newcomers are cornerback David Conner of Batesville, Miss., and junior-college wideout Cameron Kenney. Kenney is the bigger name of the two. He's playing this season at Garden City (Kan.) Community College and has a really wide array of skills. He kicks field goals, punts and even played defensive back last season. Auburn now has 22 commitments. They are listed below. * signed with Auburn out of high school in Feb. 2007. My first attempt at a practice video. EDIT: I upgraded the quality. It's about 50% better now. Hey everyone. 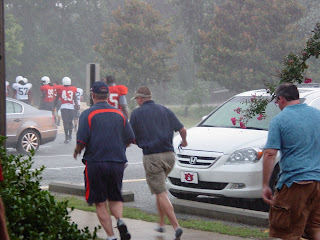 Practice was delayed significantly by a thunderstorm that rolled through the area. The shindig was to begin at 3:45. It actually began around 4:45. They went a little less that two hours in what could only be described as sauna-like conditions. It was wet. Just sayin'. 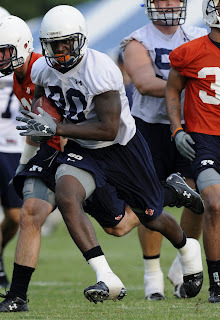 Of note, Auburn commitment Eltoro Freeman (formerly of Alex City and a 2007 signee) attended practice. He's redshirting this season at Mississippi Gulf Coast Community College, but Freeman is planning to play at Auburn beginning next spring. He'll have three years of eligibility remaining. He's looking bigger than I expected. Big in a good way. That's Raven Gray to the left. I think it's fair say he's having a tough go of it right now. Gray, who arrived from junior college last winter, missed spring drills while rehabilitating from knee surgery. He doesn't understand the practice protocols right now ... like how defenders must run off the field, buckle their chinstraps, stand up on the sideline. He'll catch on. It's just a question of when. S DeRon Furr didn't attend practice today. Coach Tommy Tuberville said afterward that he didn't know where Furr was. That's an unusual answer. Not sure what to tell you there. I thought QB Chris Todd was better than QB Kodi Burns today. Todd made some really nice deep throws during 7-on-7 drills. He also floated a few too high. Burns' passes often were too low or well short of the target. Burns is remarkably consistent on swing passes and screens, but really struggled today on crossing routes. An 11-on-11 drill mid-way through practice was pretty heated. OL Ryan Pugh and LB Merrill Johnson got into a nice little fight. Nobody was injured. Defensive subs were yelling across the field at offensive subs over something. OL coach Hugh Nall let the defenders know they were in the wrong. WR Chris Slaughter made a great catch during a late 7-on-7 drill. He snagged a long pass from QB Barrett Trotter between CB Neiko Thorpe and S Mike McNeill. The catch required unwavering concentration amid a lot of activity. Slaughter dropped at least two easy balls earlier in practice, though. WR Tim Hawthorne also made a nice grab while being double-teamed by CB Jerraud Powers and McNeill. The throw was from Todd. S Zac Etheridge was the top defensive player. He was in on several pass break-ups and drew consistent praise from DC Paul Rhoads. Tuberville said he's planning to hold the first scrimmage Saturday at Jordan-Hare Stadium. Practice Three begins tomorrow at 3:45 p.m.